Ramtin Attar, Ebenezer Hailemariam, Simon Breslav, Azam Khan, Gord Kurtenbach. 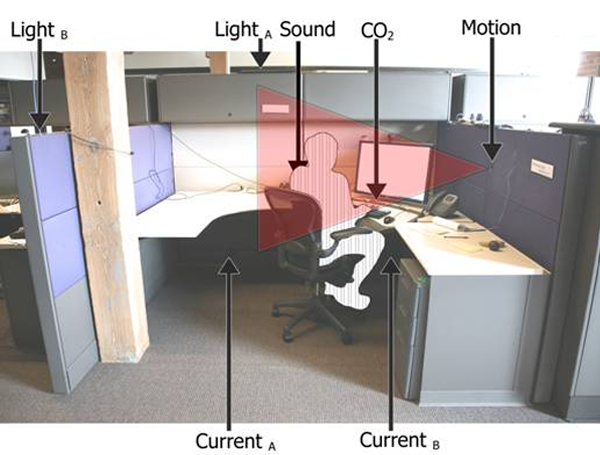 Sensor-enabled Cubicles for Occupant-centric Capture of Building Performance Data. ASHRAE Annual Conference. 2011. Building performance discourse has traditionally focused on the evaluation of a specific design. However, to increase the accuracy and ongoing validity of performance analysis, the building science community has come to understand the value of extending the focus beyond design to include the full building life-cycle. In the context of commercial office buildings, building performance analysis has been centered on the heating and air-conditioning system resulting in building instrumentation primarily serving large zones defined at design time. While this coarse level of metering and control may serve the needs of the building, a finer level of detail will be needed to better serve occupants with improved comfort levels. To move toward a more occupant-centric system, we propose the instrumentation of office furniture in the form of sensor-enabled cubicles. By considering a cubicle to be at the occupant scale, we suggest a level of data sampling sufficient to support detailed building performance visualization. To this end, we provide an overview of our current prototype that includes data sensing, data storage, and data representation to enhance the state of building performance visualization.